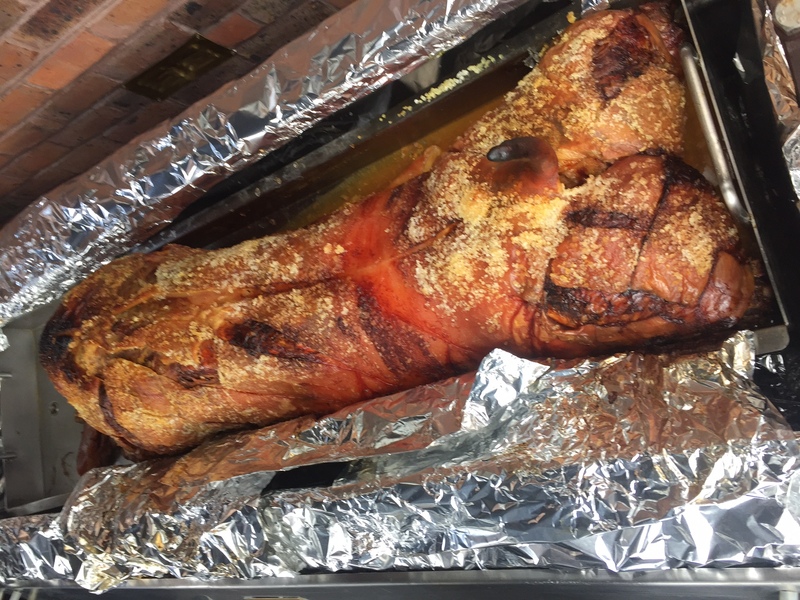 Hog Roast Leyton -Repeat Custom! We love nothing more than when customers come back to us time and time again. And last weekend we were out catering for old favourites Jim and Rita with Hog Roast Leyton. Jim tells us that Rita will use any excuse to book a Hog Roast Leyton party, as she loves the food so much! And we loved hearing that. This time it was for their nephew Jaylin’s 18th birthday. We arrived at the farm early morning and met with a hot cup of coffee we chatted about the day ahead then we left to start cooking. We set up the machines in the big out building and set up the prep table as always Rita had it set beautifully and all that was needed was the food. We placed the pig on the machine and as the pork cooked we set about making the rest of the food. We took a huge glass bowl and filled it with an array of lettuce leaves, cucumber, spring onions, cherry tomatoes and feta cheese. We made a dressing to go with the salad and placed it in a pot. We then set about chopping some sweet potatoes into wedges and then drizzled them in oil and sprinkled them in herbs and spices and set them onto cook. We made a creamy coleslaw using cabbage onions and apple this is a very popular slaw and the creaming dressing we make to blend it all together is to die for. Then it was time to place the buns and wraps in baskets and the freshly baked quiche and sausage rolls on servers, and then we made a lovely applesauce and stuffing and we were ready to serve. Jaylin arrived in first with his Grandparents and he came over to take a look at the pig his friends were amazed and were all taking pictures of the pig cooking. We sliced the pork into thick slices it was so moist and tender and the guests helped themselves to sides. We had everyone telling us how amazing the Hog Roast Leyton food tasted and Rita was telling the guests that we always do her proud. As we left Jim said he was going to ring us mid week as wants to book us for a party at his work Rita piped up its any excuse with Jim too I see! We had to chuckle.